My first impression of the world of Karuta is that it is a world full of color, of poetry and of hidden meanings. It was as much fun getting to know the characters in Chihayafuru as well as understanding the meaning of each poem from the Hyakunin Isshu (百人一首, literally “one hundred poets, one poem each”). When I first heard that there was a live action adaptation I was really excited to see it but also apprehensive because it might not give justice to its source material. But my worries were left in the dust because I found myself getting lost again in the world of cards through this film. By the end of the first part of the live action, I found myself musing that this is a live action well done. Ayase Chihaya is one who is obsessed with Karuta ever since she discovered her love for it when she was in elementary school through Wataya Arata. Along with Mashima Taichi, the three went from being classmates to becoming friends and then teammates. But afterwards, the three went on separate ways. Chihaya who is now in high school decided to form a Karuta club in order to meet her friends again. Upon finding out that Taichi also went to the same school as her, she insisted that they do it together. They successfully formed the Mizusawa Karuta Club and went on to discover more about the sport and also about themselves and what it means to be a competitive Karuta player. The film was well done in terms of pacing and storytelling. It didn’t feel rushed at all and the important elements of the story were captured well. The themes of friendship, teamwork, competitive spirit and even a hint of blossoming love, that made both the manga and the anime so appealing weren’t lost in this live action adaptation. You could say that it made one appreciate the story better and offered a new perspective to the characters too. Karuta itself is such an interesting and unique game, and the way they showed it here will certainly leave you impressed. The Karuta matches were clearly one of the highlights of the film; the speedy takes of the cards, the reading of the poems, the Japanese culture and more were all showcased very well. The slow motions were also vital in showcasing the game as it is intense at first glance but graceful at some scenes. The uniqueness of karuta shined through and also the beauty of Japanese culture and their kimonos. Karuta as a competitive sport was well portrayed, but also the meaning of the poems weren’t left out and it is incorporated in the story by relating it to the characters and how they feel as it adds more depth to the emotions in the scenes (Komano who felt alone, Chihaya with her special card, Taichi and his unrequited love, Arata who was separated from them but will eventually meet again). As for the cast, it was absolutely perfect too. I swear I cannot find a single thing I disliked about this live action. Each of the characters was given life by actors that portrayed them very well. It’s just like meeting them again after a long while but this time in the flesh. Suzu Hirose I think suited the character of Chihaya very well. Chihaya is incredibly passionate, clumsy at times, easily moved and bawls like a baby, and very much an energetic character. Hirose does a fairly good job as our karuta-loving heroine. Mashima who was portrayed by Nomura Shuhei and Wataya Arata by Mackenyu, were spot on casting as well. Though we didn’t get to see much of Arata since the focus of the First Verse was building the dynamic between the characters in Mizusawa at first, Mackenyu is already setting the stage for a well-portrayed Arata. I already like Arata as a character and I think I will like him more because of Mackenyu. There’s also the other characters, from the ever-supportive Harada-sensei, the poem-loving romantic Kana, the studious Komano, to meat-bun Nishida and even the guys over at Hukou were cast with much care to portray the characters as close to the ones in the anime/manga. Shuhei’s Mashima Taichi was one I didn’t anticipate in this live action. You see, I didn’t really appreciate this character as much when he was first introduced in the story, and it was later on in the manga that I truly looked forward seeing this character’s growth and side of things. It was Arata that I was looking for in every page and every scene back then. But in this live action (First Verse), it was Taichi who took most of my focus and it was also thanks to the spot-on portrayal of Kana by Kamishiraishi Mone, who was rooting for him and his affection for Chihaya. But, more than the blooming romance (though Chihaya remains oblivious) in this film, the core and strength of this story is the friendship and team spirit found and built through the game of Karuta. This story not only showed how each character recognized their own skill and strength in the sport but also what Karuta means to them and how it shaped their relationship with each other. Not all manga and anime should be made into live action, but stories like these, especially one very well done, should be appreciated also in the live action medium. It’s just fascinating and incredibly satisfying seeing the characters transcend into flesh and well-casted ones at that. Overall, the cast and also the cinematography managed to show the true spirit of the original. And even if you aren’t familiar with the anime or the manga, you may very well enjoy this film too! Next “Stray Kids” found in JYP’s backyard and I’m keeping them! This looks like a fun and enjoyable watch!! I might give this a try someday. Loved your review!! It is. Hope you enjoy watching! What?? THEY HAVE A LIVE ACTION?? I love Chihayafuru so much! Mostly because they were able to make a game as unattractive as Karuta look badass af! To think that it has a live action, and with a casting as fitting as that, I can NOT miss it! Enjoy ~ Tel me your thoughts when you finally do. I actually? haven’t heard about this before. I’m torn between being surprised and disappointed at myself but oh my, this sounds so interesting! Definitely will keep an eye out for this! ❤ Great post! Hope you could check this one out! 🙂 Though you might appreciate the story more if you take a peek at the anime but no pressure ^^ Thanks! 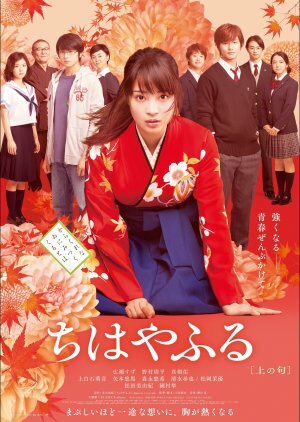 I tried getting my mom to watch it..
Pingback: 千早振る (Chihayafuru) – This is my place. Chihaya Ayase is one of the most entrancing women to grace manga, anime or the movies.